Photo: Heber Scowcroft House, ca. 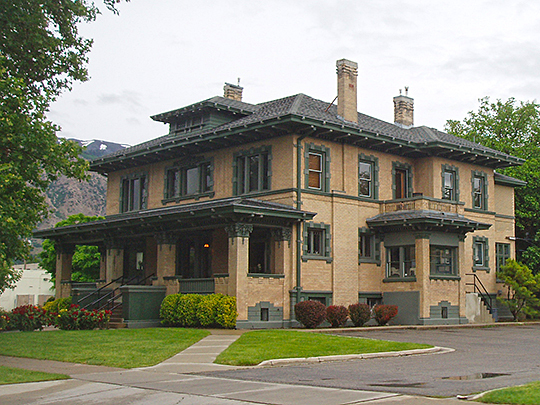 early 1900s, 795 24th Street, Ogden, UT, National Register Listed on National Register of Historic Places in 1991. Photographed by user:Tricia Simpson, 2009, (own work) [cc-by-3.0 (creativecommons.org/licenses/by/3.0)], via Wikimedia Commons, accessed April, 2013. Weber County Courthouse is located at 2380 Washington Boulevard, Ogden UT 84401; phone: 801-399-8401. Ogden is the seat of government and Weber County's largest city. Settlement began in what would become Weber County in 1843. Miles Goodyear built a trading post near the confluence of the Ogden and Weber Rivers. He also built a fort which was known as Brownsville. Brownsville would eventually be renamed and serve as the beginnings of the City of Ogden. The county enjoyed rapid growth with the completion of the transcontinental railroad in 1869.